…a new social and community centre that has opened up in Sheffield's City Centre and is on the edge of the Cultural Industries Quarter. 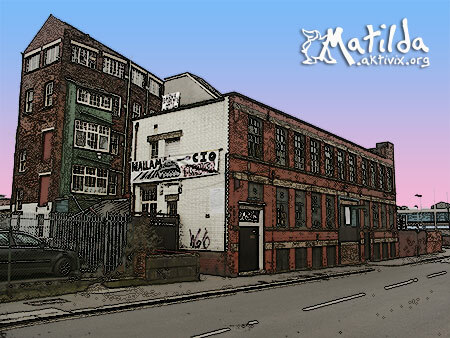 Matilda's aim is to bring grass roots creativity and a non-commercialised culture to the heart of Sheffield. We have an open social night every Thursday from around 7.30pm with a meal (if you want to cook, sign up to the cooking list). Thursdays are also workdays, usually from around 12 midday. There is always lots going on. The events page has a full listing of what's on. Internal Matilda documentation is on the SSF wiki. For a full list of what's on please see the events page. BBC news web site ran this after the eviction court process. This document was last modified by Chris C on 2006-06-27 11:28:24.